FJB Group plays an important role in the vegetable oil industry value chain (plantation / refinery / inbound / outbound logistics). Provides one stop centre for forwarding services. With FJB Group, customers are assured of hassle-free import and export activities. We provide comprehensive documentation services and will liaise with all relevant authorities such as Customs on behalf of clients for fast document clearance. 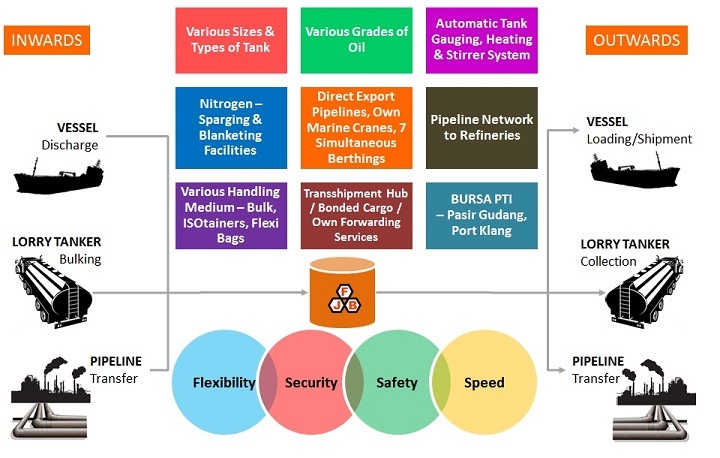 The group tank facilities are also approved by Customs for bonded and transshipment services especially for Pasir Gudang, Tanjung Langsat, Kuantan and Port Klang. © 2013 FELDA-JOHORE BULKERS SDN BHD.